The Asian crypto currency exchange Bter has made available to its users an Investment Plan opportunity, in partnership with the JUA, giving users 10% yearly interest rate for Bitcoins held in their accounts. 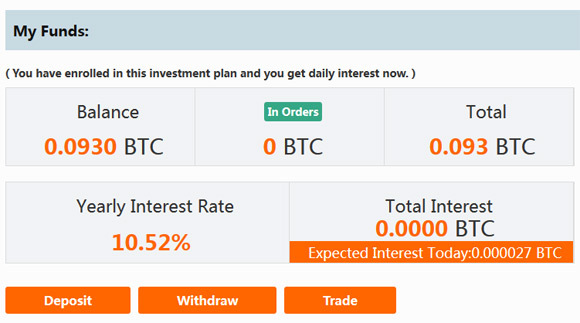 You need to enroll into the Investment plan to have the BTC in your account bring you interest rate and the good thing is that your coins do not get locked up, you can still trade with them or withdraw them at any time. The interest rate is being paid on a daily basis, depending on the balance you have available with the current early interest rate at 10.52%. Bter is able to offer this in partnership with JUA, a large scale mining farm operator, as apparently the funds are used as investment in JUA’s farms and the interest is provided by the mined coins. It is pretty much the same principle used by the HaoBTC online wallet service, but here you get paid a slightly higher interest rate on a daily basis and you can use the coins to trade in the exchange making some more extra profit.